The tab-locking type connectors help prevent accidental looseness or disconnection. The tab-locking type connectors are disconnected by pushing or lifting the locking tab(s). Refer to the figure below. Refer to the next page for description of the slide-locking type connector. A new style slide-locking type connector is used on certain systems and components, especially those related to obd. The slide-locking type connectors help prevent incomplete locking and accidental looseness or disconnection. The slide-locking type connectors are disconnected by pushing or pulling the slider. Refer to the figure below. Be careful not to damage the connector support bracket when disconnecting the connector. Lever locking type harness connectors are used on certain control units and control modules such as ecm, abs actuator and electric unit (control unit), etc. Lever locking type harness connectors are also used on super multiple junction (smj) connectors. Always confirm the lever is fully locked in place by moving the lever as far as it will go to ensure full connection. Always confirm the lever is fully released (loosened) before attempting to disconnect or connect these connectors to avoid damage to the connector housing or terminals. Srs direct-connect type harness connectors are used on certain srs components such as air bag modules and seat belt pre-tensioners. 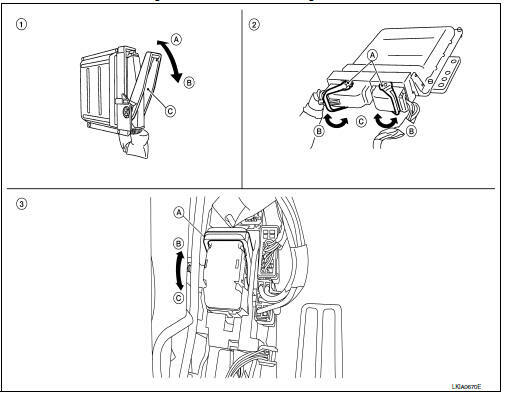 Always pull up to release black locking tab prior to removing connector from srs components. Always push down to lock black locking tab after installing connector to srs components.When locked, the black locking tab is level with the connector housing. Do not pull the harness or wires when removing connectors from srs components.